Darby was my first whippet. He was the "original." 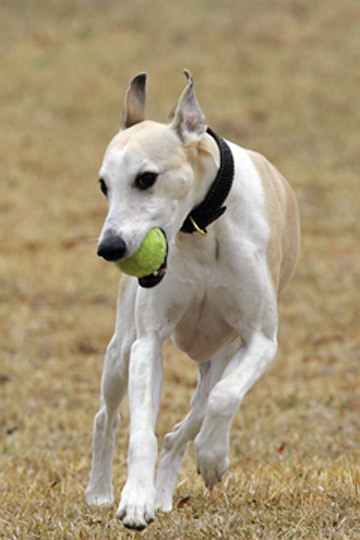 After researching the breed, whippets seemed perfect for me....Darby was "perfect." He just had a few flaws.... I wanted a running partner, & Darby had a very set limit for the amount of energy that he wanted to expend. At age 5, I discovered he had a reason for that. When we moved to the country, I stopped forcing him on the marches (jogging trips). He became a total couch potato, but remained the alpha of the pack, with Gabi becoming co-leader when he became ill.
Darby didn't like to run, but given his breeding, he has did very well on the race track was a solid "C" dog in both straight track and oval until 2004. In the spring of 2004, Darby became acutely ill. I took him to the vet, and he was in fulminant liver failure. Because he was only 5 at the time, the vet recommended an open biopsy. Interestingly, we found he had a bacterial infection with underlying cirrhosis. The cause of his cirrhosis is unknown (too much "licker", I say....). Over the next hear, he continued to decline, but then be began to get better....slowly. I thought I might have him only a few months....I had him for 5 years. To be honest, those 5 years were difficult ones with me constantly questioning if it was fair to Darby to keep him alive. After his biopsy surgery, he never totally came back. After about 2 years, I realized he had atrophy in his back, and what I thought was belly pain was actually structural back disease which caused atrophy of his one back leg. With that, the vet finally gave him rimadyl. He had been reluctant to do that because of the sick liver. He also developed a heart murmur, but that never became problematic. In the summer of 2008 he developed a lesion on his gum. I thought it was a papiloma, but it grew. It turned out to be oral cancer. When the pain wasn't being controlled, I let him go. When I look at the pictures of his last days, I think I waited too long, but with Charlie dying only 4 months before, I selfishly kept him.